All three of my daughters had notices of their births in The Irish Times. Claire (27th August, 1988), Kate (1st May, 1991), and Vicki (3rd May, 1995) were all born by Caesarean section in the Rotunda Hospital in Dublin. I don't have a copy of Claire's birth notice, but here are the ones for Kate and Vicki. I kept the newspaper of Vicki's date of birth and the paper in which this notice appears. I only have a (torn) cut out of the notice of Kate's birth. I also have had one letter published in The Irish Times on 10th March, 1990. 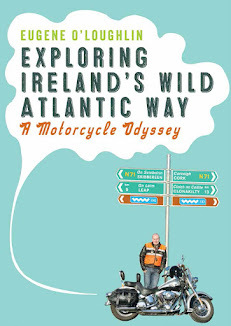 I had been working in CBT Systems in Mount Street at the time and used to cycle from Rathfarnham to work on most days (this was before we got a second car, and long before I got a motorbike). 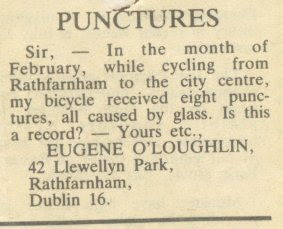 To be honest, I'm not sure how many punctures I got, or if they were all in February - but there were a lot! I spent a lot of time repairing punctures in the cold - there were all caused by glass. I have always been facinated by the "Is this a record?" letters to the Editor of The Irish Times and decided to have a go myself. Much to my surprise the letter was accepted and published!